It was early in the morning at Laurel-Snow State Natural Area just northeast of Dayton, Tennessee. Arthur Gothard opened the gate to the park, then walked down the double-track trail along Richland Creek, following the path of an old railroad. Arthur had spent decades exploring these rugged hills, but something was making him uneasy. Nearly opposite the stone arch that marks a darkened entrance to the Dixon Slope Mine, he stopped and listened. He could not shake the feeling that eyes were watching him from across the rushing waters of the creek. Then Arthur heard it. From the opposite slope came a series of knocks, as if someone was hitting one stout piece of wood against another. 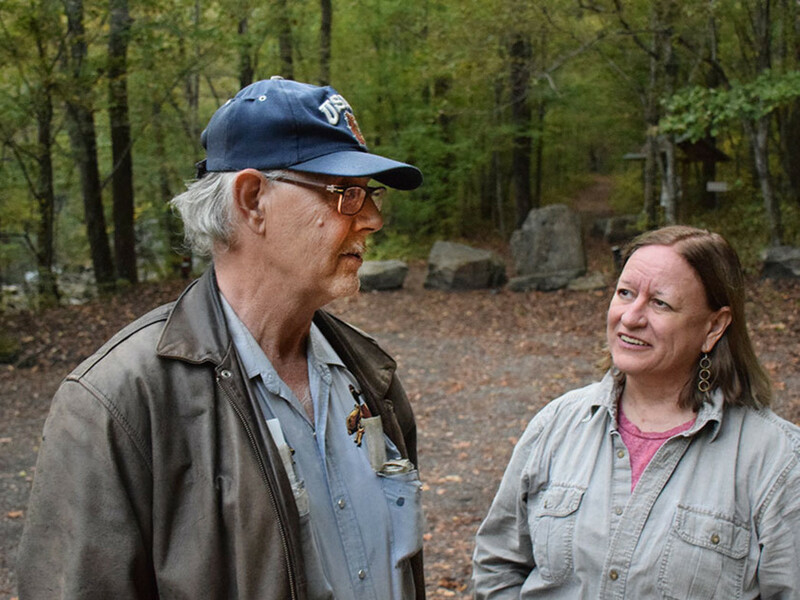 In his years at Laurel-Snow, Arthur has never seen Bigfoot, but more than once he has heard “tree knocks” and been hit by rocks and gravel thrown from the woods—activities that are often attributed to the legendary Sasquatch. The Dixon Slope Mine seems to be an epicenter for such events. One of the arched entrances, which was actually built for ventilation, is right on the trail less than a quarter mile from the parking lot. Uphill is an even larger arch that served as the main entrance to the mine. 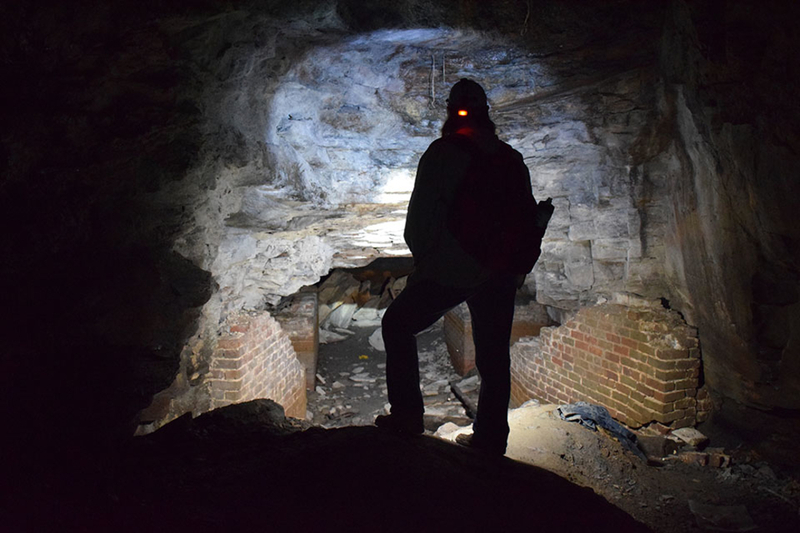 Today the passage has collapsed, but a hundred years ago it tunneled a half mile up the gorge, crossed underneath Richland Creek near its intersection with Morgan Creek, and connected to the rear workings of the Nelson Mine that underlie the entire western slope of the gorge. 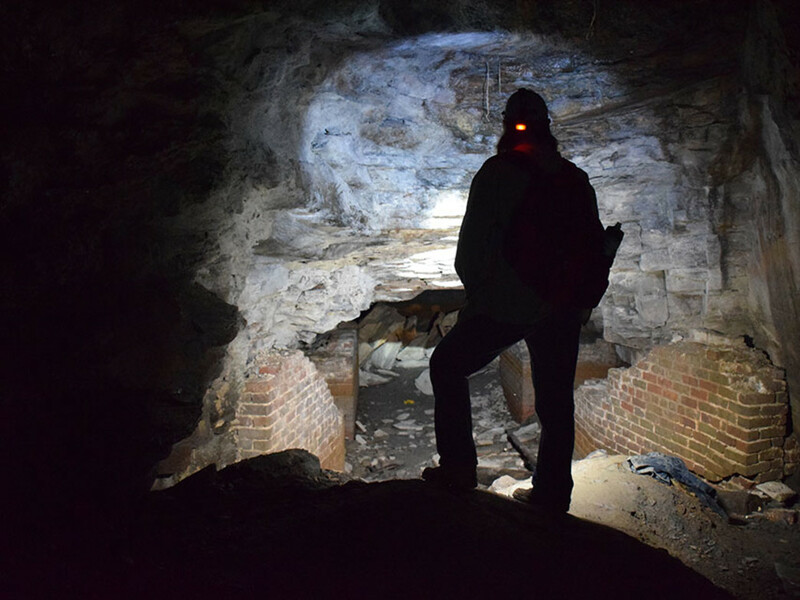 Abandoned mines and workings are a common sight on the Cumberland Trail, but nowhere is the history as telling as it is at Laurel-Snow. In 1884 an Englishman named Titus Salts formed the Dayton Coal and Iron Company, changing the landscape of the town and the Richland Creek watershed forever. Salts and his investors purchased over 30,000 acres and poured nearly $40 million in today’s currency into building blast furnaces and infrastructure to produce iron. Coal from mines in and around Richland Creek, heated to form coke, fueled those furnaces. Nearly 30 miles of railroads, bridges, coal tipples, crushers, a huge company store, 377 coke ovens, and 200 company houses took shape. The population of Dayton boomed; there was talk the town could become the iron capital of America. Mining has always been a dangerous business, but in those days there was an almost constant and appalling loss of life. Most workers were paid by the amount of coal extracted (as little as 36 cents a ton at Dayton Coal and Iron), so time spent doing anything but digging and moving coal took money from their pockets. “Miners are entirely too indifferent to the dangers which surround them,” Mine Inspector F.P. Clute wrote in 1886. Explosions were the biggest killers, throwing men against walls, burying them under slate, burning the clothes and skin off their bodies. Miners who survived the blast often suffocated in the “after-damp,” the deadly carbon monoxide produced by the explosion. 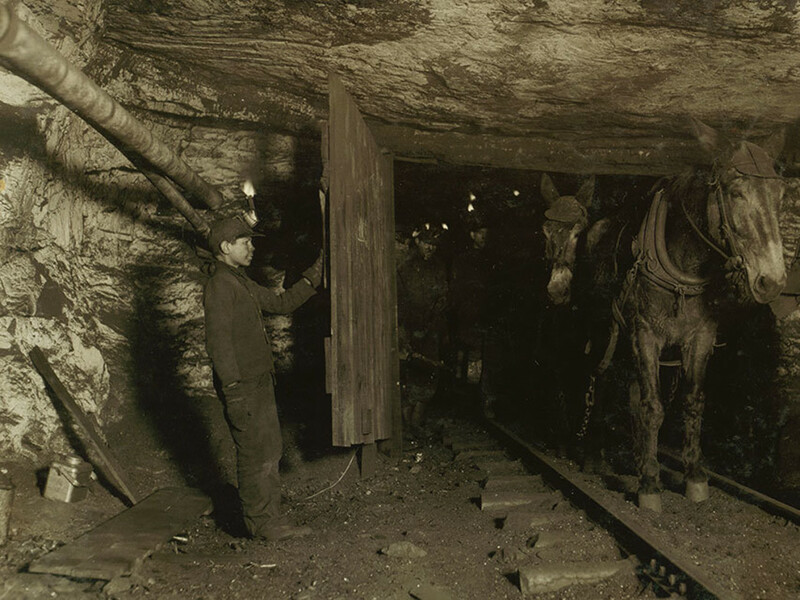 In dry mines like the ones operated by Dayton Coal and Iron, explosive coal dust coated everything—including, of course, the lungs of the miners. Most mines also contained “fire-damp,” methane gas that was easily ignited by the oil lamps commonly in use. A designated “fireboss” made the rounds of the the mine, checking for gas. By law, a mine had to be carefully ventilated so that gases would not accumulate. 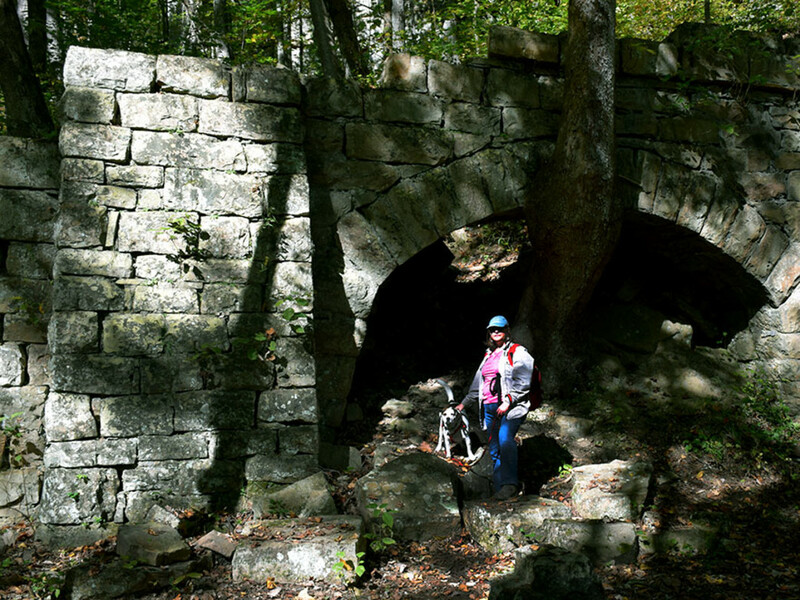 On the hillsides above Richland Creek are “furnace vents,” vertical shafts which used fire at their base to force air upward, but by the 1890s mechanical fans were being used, with brattice walls and doors used to direct air down specific tunnels. Boys as young as 12 years old were employed as “trappers,” opening and closing the doors for loads of coal pulled by mules. Although accidents and death were all too common in the mines, the first large-scale disaster did not occur at Dayton until 1895. Over the course of a decade, the Nelson Mine had been worked over two miles into the mountain. Early in the morning of December 20th, 1895 a miner who had been sent to check for gas triggered an explosion that ripped through the far reaches of the mine. Twenty-eight men and boys were killed, some by the explosion and falling rock it produced. Others, victims of the “after-damp,” lay dead but seemingly unharmed on the floor where they had collapsed. It was days before the mine could be ventilated and the passages cleared to reach all of the bodies. The following March, another “blown blast” in the Nelson Mine caused an explosion that killed 21 men. Three of the fatalities were workers standing outside the entrance when the fireball erupted. The shift had ended at 4:30 p.m. and the firemen set off their charges fifteen minutes later, before all the miners were out. Despite the tragedies, frequent labor disputes, and fluctuating prices, Dayton Coal and Iron reported generous profits each year until 1913. In that year, managers were certain the United States would soon enter World War I and saw an opportunity to make huge profits by buying and stockpiling iron in advance. When America continued to delay and prices for iron plunged, the company found itself over-extended. The operations manager committed suicide and the company went into bankruptcy. New investors resumed production, but by 1925 the iron industry in Dayton was coming to an end. The Scopes Monkey Trial, a publicity stunt devised by the mining company, put the town on the front page of papers across America for a time, but it wasn’t enough to keep the industry alive. Earlier in the summer I had heard stories about ghosts at Laurel-Snow, and that a gracious and friendly man named Arthur could tell us more. It was nearly Halloween, which seemed fitting, when my wife and I drove out to see if we could find any ghosts. We walked two miles up the old railroad grade along Richland Creek, passing the Dixon Slope Mine and massive concrete footings for a railroad bridge built around 1920. Somewhere below our feet was a network of tunnels and abandoned workings from the Nelson Mine, and hidden inside the hillside above was another mile or more of tunnels in the Richland Mine. The path narrowed and we could see the remains of a massive water line, installed to supply the town of Dayton after the mining interests withdrew. At a junction we turned right to climb the eastern slope to the base of Laurel Falls, a magnificent 80 foot ribbon of water lit by the sun. I wondered how many of the miners might have brought their wives and children here. Did families in their Sunday clothing sit on these same rocks and unpack a picnic lunch, gazing up through long vanished Chestnut trees at the sunshine and falling water? If the horrific explosions and wails of the newly widowed had somehow made a lasting impression on this place, a faint echo that still resonates, there must also have been happier sounds here to balance that. Surely there were at least some memories of laughter and smiles from days spent above ground. So often history is hidden right beneath us, unseen but occasionally poking up through the earth as an old foundation or ruin, an unsigned tombstone to forgotten ambitions. Nature, always in search of equilibrium, reclaims and buries the dead, making beautiful what once was foul. 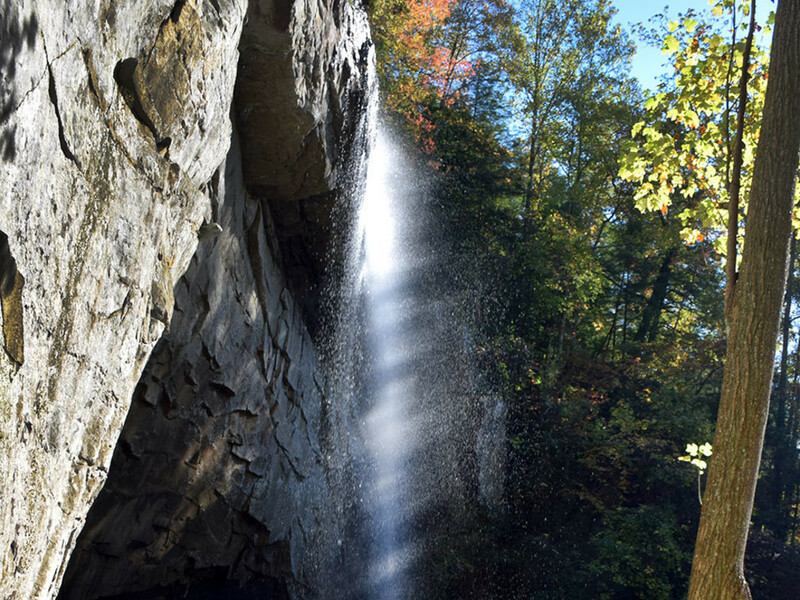 Today Richland Creek, where coke ovens and railroad engines belched smoke and steam, remains an economic force for the town of Dayton, but now as an attraction for hikers and paddlers who come to experience its waterfalls, dense forests, soaring cliffs, and swimming holes. Perhaps the preservation of this place is a testament that human intentions can change for the better, too. In the parking lot that evening, as Arthur came to lock the gate, we listened to his stories of Bigfoot, of mountain lions and black panthers and voices coming from darkness in the mines. It was fascinating, but those weren’t the ghosts we had encountered at Laurel-Snow. More than a century after they died so cruelly in darkness, I suspect those lost miners have long since found sunlight and peace. Flowing alongside the healing waters of Richland Creek is a larger drama that contrasts the towering ambitions of industry with the modest dreams of its workers, a tale of greed and exploitation but also of courage, love, and redemption. These are the ghost stories of Laurel-Snow. On the site of the blast furnaces in Dayton are sports fields where families gather. As my wife and I drove slowly by we could hear the joyful sounds of children playing.